The Bach Dancing & Dynamite Society is located in the Douglas Beach House, 311 Mirada Road, Half Moon Bay, on the corner of Mirada Road and Cortez. There is a wooden sign in the middle of the building by the steps. There is limited parking behind the building. Take Highway 92 West to Hwy. 1 in Half Moon Bay. Important . 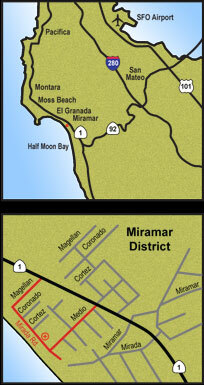 . . DO NOT TAKE MIRADA ROAD OFF HIGHWAY 1. It does not go through to the Bach due to footbridge. To avoid traffic, we recommend that you either come early (10:30 am) and enjoy the beautiful San Mateo County coast and/or Half Moon Bay before the concert, or plan your drive so that you are at the reservoir on Hwy. 92, or through the tunnel on Hwy 1 by 3:00pm. You will arrive at the Bach Society well before the music starts at 4:30.